Author Pam Houston at Beach Books in Seaside. I had the pleasure of meeting author Pam Houston at Beach Books in Seaside as part of their Lunch in the Loft series. I’ve been a fan of Houston’s writing since her debut novel, “Cowboys Are My Weakness,” came out in 1992. 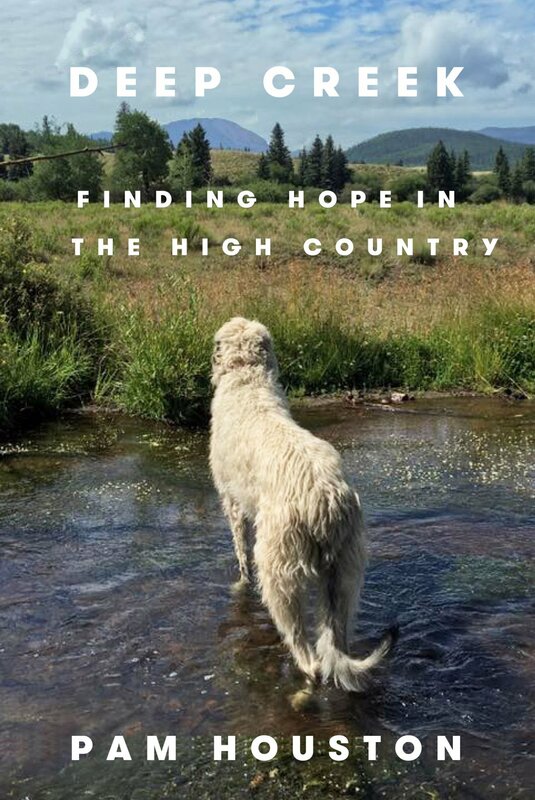 Houston’s deep in the trenches of a book-tour promoting her latest, “Deep Creek: Finding Hope in the High Country,” a memoir that officially launched April 2. Although some reviewers and interviewers have narrowed their focus to a particular aspect of the book — i.e., parental and sexual abuse — others have called the new work Houston’s love letter to the planet, the creatures living on it, and a life lived in relationship to the land. Houston is no stranger to Seaside; this was her third or fourth time at Beach Books. This time she brought along her new husband, Mike, and took a morning beach walk. The story of how “Deep Creek” came together began when her editor at Norton suggested she base her next book on an adventure she’d like to take. Houston has a bucket list of things to do and places to see, but realized she is halfway through an adventure she undertook nearly two decades ago when she put down the $21,000 advance she’d received for “Cowboys Are My Weakness” as a small down payment on a 128-acre homestead in Colorado located in a valley at an elevation of 9,000 feet. While much of “Deep Creek” is about Houston’s ranch and the creatures living on it, the book also explores Houston’s family and her growing up. During the Q-and-A period — over cream of mushroom soup and chopped kale salad provided by Dough Dough Bakery & Fermentation Station — someone asked the author a question about her life that had the word “victim” in it. “I never felt like a victim,” Houston said. She talked about living her life. Beyond ranching and caring for her land, Houston’s time revolves around a steady diet of writing and teaching. In addition to her career as a novelist, essayist and short story writer, Houston is a professor at UC Davis and teaches at the acclaimed Low Rez master of fine arts program at the Institute of American Indian Arts. She is also the co-founder and creative director of the literary nonprofit, Writing By Writers. She is a devoted leader/mother of wolfhounds, and recently married her sweetheart. Houston told the audience she recently created a conservation easement for her Colorado property so it will remain a minimally developed place in perpetuity. She described the ranch as her place to think, breathe and be — a place to refresh her mind. “There’s so much beauty in the world that we can celebrate and still be able to hold the grief,” she said. For more information about Pam Houston, visit pamhouston.net. For more information about Beach Books’ Lunch in the Loft series, visit them at 616 Broadway St. in Seaside, or call 503-738-3500.